Hangawi is a vegan Korean restaurant in midtown Manhattan. They serve a lot of creative vegan interpretations of traditional Korean dishes in a classical Korean restaurant setting – shoes are removed at the door and you sit on the floor with your legs hanging in a recessed space under the table. We tried four of the appertizers and the Ssam Bo, which is is a platter of slivered vegetables, three types of rice, a grain, and miso paste which are eaten wrapped in lettuce and sesame leaves. I thought the mushroom caps stuffed with tofu and vegetable appetizer and the Ssam Bo were both excellent, unfortunately the dumplings were not. 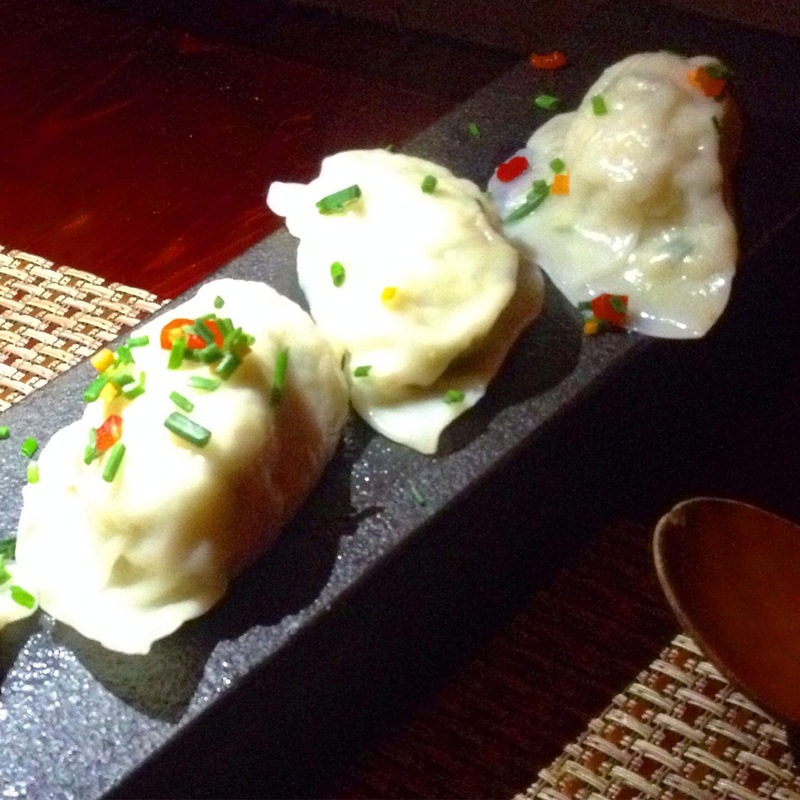 The Dumplings: The vegetable dumplings are clearly homemade but not in a good way. The dumplings were stuffed with tofu, with very little else mixed in to add flavor. Unfortunately, Hangawi does not make (or use) amazing and flavorful tofu like some of the other restaurants in Korea-town (try Cho Dang Gol for great homemade tofu). Hangawi’s dumplings are large and eating them was like eating big spoon fulls of flavorless steamed tofu. The Dipping Sauce: The dipping sauce was an orange, relatively thick, pepper sauce that worked well to add flavor to the dumplings. The Location: Hangawi is located on the outskirts of Manhattan’s Korean-town, on 32nd street between 5th and Madison Avenues. This entry was posted in Korea, Mandoo, New York City, Steamed, Uncategorized, Vegan, Vegetarian. Bookmark the permalink.